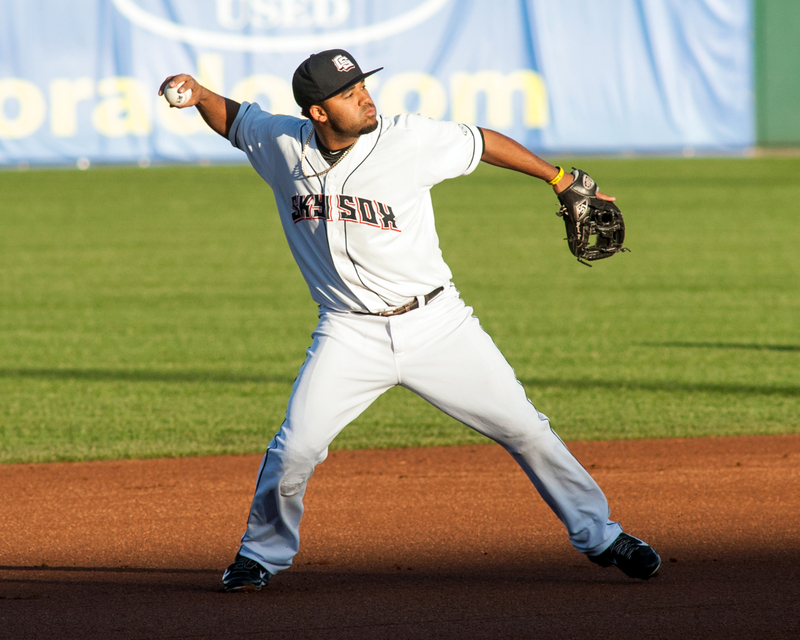 IT TAKES TWO: Heading into Sunday’s game, Sky Sox infielder Rafael Ynoa had yet to hit a homer on the season. That changed quickly as Ynoa lead off the game with a solo homer to right. In the 7th, he followed that blast up with a second bomb to right for just the second multi-homer game of his career. The only other time Ynoa has smacked two homers in a game was on 6/9/13 against the Jackson Generals while he was playing with the Chattanooga Lookouts. He was also batting in the lead-off spot in that contest. COWABUNGA, RAFAEL: After hitting just .191 (13-for-68) in May, Rafael Ynoa has had a heck of a month thus far. He currently is hitting .315 (28-for-89) in the month and continues his hot streak from the lead-off spot. In 23 games hitting No. 1, Ynoa is hitting .293 (29-for-99). From other spots in the lineup, Ynoa is only hitting .235 (19-for-81).This month, he has 10 runs, two homers, five doubles, nine RBI, and nine multi-hit games. In the first two months of the season, he had just six multi-hit games. With his four-hit contest last Sunday, Ynoa became just the second Sox player to collect four hits in a single game (Michael McKenry, 4/26 vs Iowa). MANNY BEING MANNY: In his start on Monday, Manny Corpas turned in three shutout innings in his first start since 2003 when he made 15 starts for the Tri-City Dust Devils. The gap between starts spanned ten years and 556 games combined between both the majors and minors. Corpas ended up surrendering just three hits in his three innings of work to go along with a strikeout and no walks on 51 pitches, 40 strikes. Although he couldn’t qualify for the win, Corpas gave the club what they needed. BIG BEN: With his team-leading 13th home run Saturday night, Ben Paulsen continues to lead the Sky Sox offense. The left-handed hitter is currently leading the Sox in almost every single catagory including average (.293), homers, triples (5), RBI (48), runs (50), and hits (79). The only offensive catagory of note that Paulsen doesn’t lead the team are stolen bases (Jason Pridie, 20) and doubles (Kyle Parker, 20). SEND ME AN ANGELYS: Sox infielder Angelys Nina has been hot a the plate recently and after going 2-for-4 last night with three RBI and is riding a season-high, eight-game hitting-streak. Over that span, Nina is hitting .333 (12-for-36) with two homers, four doubles, eight runs scored and 10 RBI. JUST LIKE HE DREW IT UP: With his 2-for-4 performance Saturday night, infielder Drew Garcia extended his season-high hitting-streak to nine games. He walked as a pinch-hitter last night to keep his streak alive. During the streak, Garcia is batting .324 (12-for-37) with 3 doubles, 6 runs scored and 3 RBI. I CAN SEE CLEARY NOW: When OF Jason Pridie sustained an ankle sprain running to first on June 13, it made room for . to be called up from Double-A Tulsa. Since his promotion, Cleary has batted .324 (11-for-34) in 10 games including four multi-hit games. He’s also scored four times and driven in six more. WHERE THERE’S A WIL: Including his three shutout innings last night, in the past month (5/22-6/22) Wilton Lopez has been solid out of the pen. He’s gone 1-1 in that span with a 3.00 ERA (7er/21ip) while walking just three and striking out 20. Over that stretch, he’s lowered his ERA from 5.60 to 4.19 and hasn’t surrendered any home runs. WELCOME BACK PARKER: In his first two games back from the Rockies, outfielder Kyle Parker picked up right where he left off before his promotion by going 4-for-8 with five runs scored, and three RBI in two games against Reno. Parker now has 43 runs scored on the year and 41 runs driven in as well. WHAT CAN BROWN DO FOR YOU? In his last six appearances, Brooks Brown has allowed only one unearned run in 9.2 innings of work and has struck out 10 against four walks, and has allowed just four hits. After having a 6.10 ERA in April and May, Brown has an ERA of just 1.98 (13.2 ip, 3er) in nine June appearances.